Parry Sound Ontario is a delight for cruising sailors. The Sound itself is a deep indentation in the coastline, offering a deep and well-protected sailing area. Its rugged shoreline has small coves, bays and hidden anchorages that alone could take a couple of seasons of gunkholing to thoroughly explore. The town of Parry Sound lies on the far eastern shore of the Sound. Parry Sound Ontario is well-known in Ontario as a vacation destination. 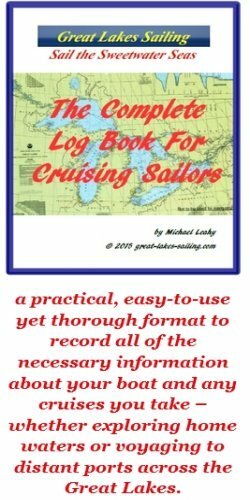 For sailors, in addition to having everything you may need (parts, supplies, provisions and services), it has good docking options. It also reputed to be the world's deepest fresh water port (Canadian Geographic) - certainly the deepest on Georgian Bay! Established in the middle of the 19th century, Parry Sound Ontario has its roots in the booming lumbering industry of the 1800's. It was named by naval surveyor Captain Henry Bayfield after Admiral William Parry of Arctic exploration fame. (Bayfield, ON is named after Capt. Bayfield. ) The arrival of the railroads spurred growth and as early as pre-WWI, tourism was starting to make itself felt. As the lumbering industry declined, tourism became an economic mainstay. The Main Channel into Parry Sound Ontario is well-marked. Make sure you stay within the channel as these waters are replete with rocks and shoals lurking at or near the surface. Look for the Seguin Bank lighted buoy GREEN "P1". Follow the marker buoys up the channel and into the Sound. Once in the Sound, continue to follow the marked channel as you head to the east side of the Sound. Once you clear Parry Island, at Salt Point, alter course to 150.5o and follow this range line into the harbour of the town. There are 2 tall towers in the town of Parry Sound Ontario, one on either side of the river. On the north side, there is a microwave tower 225 ft/69 m high marked with RED lights. It would be visible offshore in good weather for just over 17.4 nm. On the south side of the river, there is a 96 ft/29 m tower also marked with RED lights. It will be visible in good weather for slightly more than 11.4 nm. As you move up the channel, you will pass a RACON buoy broadcasting a Morse M (— —). From the north and the south, there is a special charted route called the Small-Craft Route. There are separate charts showing this route. These are very scenic routes but they must be navigated with great care. There is docking for up to 15 vessels at the municipal dock. There is no fuel dock but fuel deliveries can be arranged by staff. There is a pumpout station. Water and power are available at dockside. There are washrooms and showers. The dock is right in the centre of downtown so it is close to restaurants, shops and services. Big Sound Marina has 136 slips (including 16 at the municipal dock) and has a 100% transient docking policy. There is no fuel dock or pumpout station. Water and power are available at each slip There are washrooms, showers and laundry facilities. There is an on-site convenience store. BBQ grills are available and there is internet access. The marina also offers a shuttle service to a local grocery store. Parry Sound Marine has a few transient slips available. There is a fuel dock (diesel and gasoline) and a pumpout station. Water and power are available dockside. There are washrooms. There are mechanics on duty able to carry out repairs and maintenance to engies, mechanical and electrical systems. There is a haulout facility. Sound Boat Boat Works is located in the harbor. There may be some space for a transient sailor but you will have to call ahead. There is a fuel dock (diesel and gasoline) and pumpout station. Water and power are available dockside. This is a full-service marina offering a complete range of repair and maintenance services to both power and sail vessels. There are washrooms and showers. Other amenities include a swimming area, picnic and BBQ areas and a childrens' playground. There are a number of grocery stores in Parry Sound Ontario. The largest would be Sobey's, about 2 mi/3 km east of the harbor. You would need transportation. Most of the major banks are represented in Parry Sound, all of them at or near the main intersection downtown. It would be about .5 mi/1 km from the harbor. West Parry Sound Health Centre (705) 746-9321 is a modern, well-equiped haspital located about 1.6 mi/2.5 km from the harbor. Ben's Pharmacy (705) 746-4811 is located about .5 mi/.8 km from the harbor. Parry Sound Ontario has a good selection of restaurants and pubs. Restaurant Kudos Kuisine offers an up-scale dining experience in a relaxed setting. It is right on the waterfront with views over Georgian Bay. Downtown, you will find places like The Arizona Grill serving a standard pub fare, Wellington's Pub & Grill a popular local pub and - exactly what you would expect in a dyed-in-the-wool hockey town - Don Cherry's Sports Grill - a great sports bar and restaurant. The summer season in Parry Sound Ontario is packed with things to do. Parry Sound is a major tourist destination so there is something to see or do throughout the summers months. To begin with, the town is surrounded with outstanding natural beauty. A walking trail begins at the harbor and leads to the Seguin Trail outside of town. The Dragon Boat Festival brings spectators from all over the world. Art In The Park is a 30 year old arts and crafts program that runs throughout July. The Festival of the Sound is a 30 year music and performing arts festival that showcases some 50 performances over a 3 week period. Tugfest is a celebration of working Great Lakes tugs each August. There are shops and small boutiques to explore downtown and cafes just to enjoy people watching. If you would like to let someone else take the helm, the Island Queen, Canada's largest cruise ship, departs from the town dock daily for 2 and 3 hour cruises through the 30,000 islands. Parry Sound Ontario is a great place for a cruising sailor to visit. This Parry Sound Ontario tourism and visitor's site will give you some ideas on getting the most of your visit.